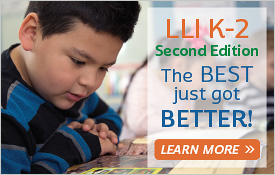 Strengthen instructional decisions with resources designed to elevate literacy expertise. 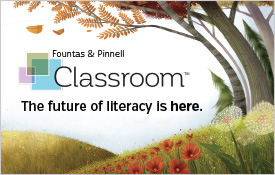 Transformative professional learning underpins Fountas & Pinnell Classroom™ essential instructional tools, practical professional books, motivational professional development, and insightful assessment for high-impact literacy teaching. The single most important factor in students’ literacy success is skillful, informed teaching. Fountas and Pinnell are committed to elevating teacher expertise through meaningful professional learning. Their collective work to date establishes a cohesive and coherent set of professional tools to make teaching efficient and transformative. 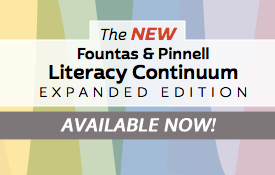 Fountas & Pinnell Classroom™ brings together decades of research to help teachers work in highly effective ways with students, learn more about literacy teaching, and engage in continuous professional growth. Fountas & Pinnell Classroom™ is designed to create a sense of community among teachers who are concerned not only about what students learn but also about how and why they learn. A spirit of inquiry and intellectual curiosity permeates Fountas & Pinnell Classroom™, and the educators in the school offer a model of collaboration and continual learning. The following professional learning opportunities are available to further develop the teaching craft and foster a climate of collegiality and community. Proficient readers and writers display recognizable behaviors at every phase of literacy learning. When teachers notice, teach, and support these behaviors, they link assessment to responsive teaching. This indispensable literacy tool identifies the behaviors that demonstrate thinking and understanding within, beyond, and about a text. These behaviors are described as continua of learning across eight instructional contexts. Take a look at the Fountas & Pinnell Classroom™ PreK–6 Implementation and Release Schedule. This detailed timeline chart will show you which FPC Instructional Contexts will release and when. Explore the transformative professional learning opportunities to further develop the teaching craft and energize your practice.